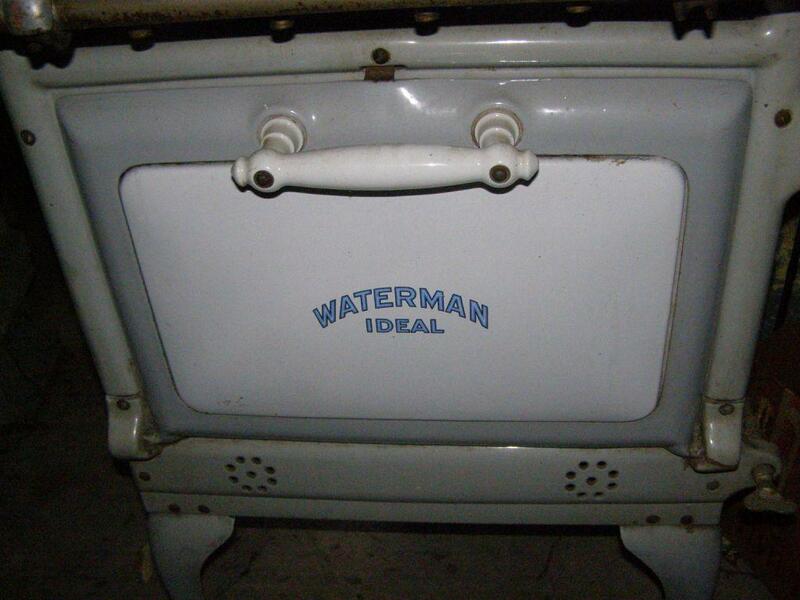 I have received a number of emails from people looking to sell their Waterman stove, in need of parts or wanting to buy a particular model. Here is your chance to connect with others. Head down to the form below to add your listing. Be sure to include your email address in the body of your message so others can get in touch with you. There is no way to add photos to comments – if you would like, send me photos and I will add them here for you. Also consider Craigslist and ebay. Waterman stoves turn up there occasionally, esp in the metro NYC area. Sept./Oct. 2011. Manolis has this Waterman stove for sale. See the comment below with contact info. 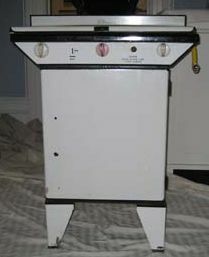 I have a hinged top – three burner Waterman stove. It is mint green & cream (with black accents) and measures 27 1/2″ wide X 15″ deep. 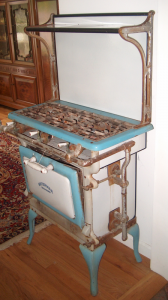 When I bought it in 1984, it had all four knobs in place and a pull handle on the oven door. A short time later one of the knobs fell off, never to be found again. I didn’t realize they had set screws in them to keep them tight. I’ve been searching for years to find mint green knobs. Would you know where I might buy one? I have a 4 burner waterman stove. I need the cast iron burners mine split in halves. My water man use to be propane and I made it into gas burner. I have used it since 1975. No one stocks parts for these stoves. Your only hope is to find a parts stove. Most Waterman stoves remain in the greater NYC area (they were made in Brooklyn) I would suggest putting a want ad on the NYC area Craigslist site. Bear in mind that the burners may vary a bit from model to model. I have a Waterman stove identical to #14 on the page of photos on this site. 3 burner gas stove/oven. Would love to give it a good home. It’s in fair condition–rather grungy but cleanable. Missing it”s knobs and oven handle. Have pictures to share. I have had my Waterman Ideal stove for over 25 years. I purchased it from my friends great aunt, me being the 2nd owner. I love it, easy to clean with the pull-out bottom shelf under the burners. The door to the oven has broken at the joint, making it difficult to close, but it doesn’t stop me from cooking all these great dinners. I feel very lucky to have my stove and would love to be able to fix it like new again. We tried using liquid soder but it did not hold. Any suggestions? You might find an epoxy will work or perhaps some sheet metal screws. There are several stoves for sale right now in this BUY SELL PARTS page…check the comments and listings! I am looking for replacement knobs for a 1934 Waterman stove. Waterman four burner available on Long Island. Make an offer. Photos on the way. 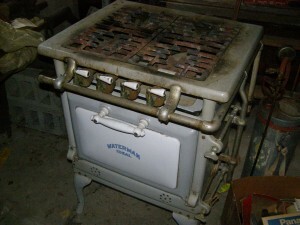 Waterman antique stove in good condition, 20 x 22 x 90, 4 burners and oven. Faux-marble enamel side panels. Asking for $300 or best offer. We’re selling as we’re renovating. Call Manolis at 347-259-4632. I have a 4 burner beautiful waterman stove for sale. Must pick up in brooklyn. I have a waterbury special furnace that i am trying to find out what it is worth and am not finding any luck, maybe you could help. I think it is from the early 1900’s but not sure. It is the furnace and it has an enclosure that surrounds it with a door that opens in the front. Any info would be greatly appreciated. Waterbury and Waterman are two different companies…wasn’t Waterbury located in Minnesota? 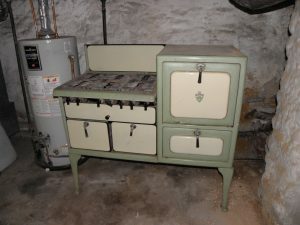 We have a Waterman stove similar to the one pictured above “Sept/Oct 2011. Manolis….” Anybody know what these are typically worth? Did you read my Value section at http://antiquesdiscovery.com/waterman/? Did you read my Value section at http://antiquesdiscovery.com/waterman/ ?? I provide a guideline and try to hammer home the basic concept that condition is EVERYTHING to value. Four-burner Waterman (three photos already posted) on Long Island is now FREE. Taker is responsible for delivery. Delivery (for a pre-paid charge) to Long Island or Southern New England might be considered. Please feel free to post this new information. If Bill Kay from Long Island or Richard in Manhattan still have Waterman stoves available, please contact me at cahasknob@aol.com. I live in Virginia but will be travelling to Long Island at the end of June and would be interested in chatting about the stoves. Thanks. I am also interested in the waterman stoves if they are still around. 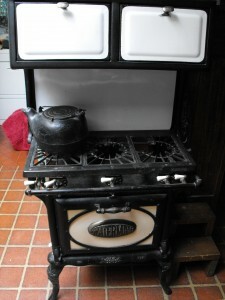 I just mentioned that I am interested in the waterman stoves that were for sale… But thought I would make it known that we are looking for any vintage stove that is working, has a gas range, and is 30 inches or narrower.